Massachusetts just sent the US Senate a pure and passionate voice for an unwavering progressive vision. 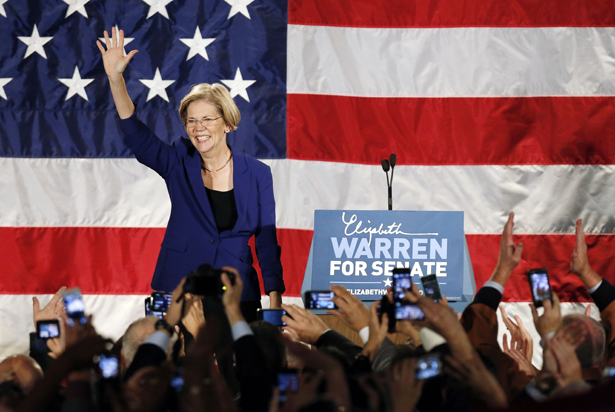 They were insane at the Warren party in a gilded ballroom at the Fairmont Copley in downtown Boston. I’ve never spent election night with a campaign before, but I don’t think I’ll ever spend election night at home alone again. With two huge screens up front cycling among the regional cable news and various TV news stations, the screams got louder every time the numbers flashed on screen. Every color that you can find in Massachusetts was here: ruddy faces descended from the Irish, gray no-product hair and purple fleece vests from the People’s Republic of Cambridge, young white guys with square glasses and cool sideburns, Harvard law students in sleek suits and perfectly plucked eyebrows, black guys in dreads, a range of brown tones from South Asia to south of the border. Shoulder to shoulder, so jammed it was hard to make it through the room, they were beaming, grinning, screaming like rock fans, delirious with glee. They roared with happiness at all the small New England victories: Congressional seats, Connecticut’s Senate seat, New Hampshire’s delegation. They roared every time Obama won another state: Vermont, New Hampshire, Michigan. Her political passion, authenticity, sheer charisma and clear-as-a-bell progressive beliefs brought in an astonishing number of volunteers, many of whom had never done anything before for a political campaign. In the first months, the campaign was overwhelmed, but by June the state party was putting everyone to work knocking on doors and making calls, with an incredibly simple script, keeping track for the get-out-the-vote system to come in the final week and on Election Day, as The Boston Globe reported in depth. The system, which Walsh and Patrick and others envision as a way to restoring politics to people rather than screaming pundits, worked so well that it could—and should—be a model for the rest of the country. “We love you!” someone cried out. “I love you!” she cried back. You’ve heard her credo. You’ve seen her ruthlessly interrogate Timothy Geithner, the banker’s champion. She has the charm to work with anyone, the ability to negotiate the small things, and the relentless ferocity to push through the large things. She may be a junior senator, but there’s no doubt that she will help energize and rally the newly expanded progressive caucus—yo, Tammy Baldwin! She’ll attract and inspire talented staff who’ve been dying to actually do something in Washington, pulling for a genuinely progressive tax code, for regulations that restrain rapacity and keep consumers in mind, for investment in education and infrastructure, for women and LGBT folks and service members and retired people. Read George Zornick on Obama’s agenda for his second term.